As crowds go, the one gathered for the 14th Annual Twelfth Night Revel at Emory's Woodruff Library in mid-February was a bibliophile's dream — a guest list peppered with literary luminaries and award-winning scholars deeply rooted in Emory connections. 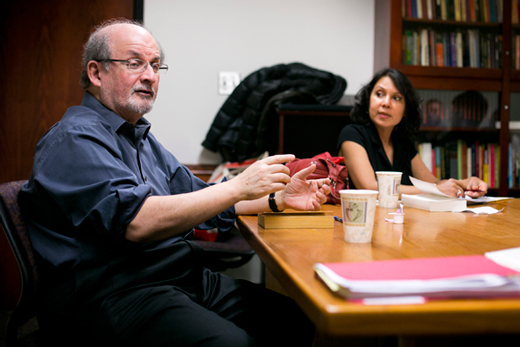 One moment, acclaimed author and University Distinguished Professor Salman Rushdie was paying tribute to the memory of Irish poet Seamus Heaney, both of whom have papers housed in Emory's Manuscript, Archives and Rare Books Library (MARBL). Later, Pulitzer Prize-winning Irish poet Paul Muldoon — who studied under Heaney and also has his papers housed in MARBL — read from his own writings, as well as the late poet's works, now the focus of a major Emory exhibit. A guest reader shared the poetry of U.S. Poet Laureate Natasha Trethewey, who is Robert W. Woodruff Professor of English and Creative Writing and director of Emory's Creative Writing Program, while others read their own work, including PEN award-winning poet Kevin Young, Atticus Haygood Professor of Creative Writing and English at Emory and curator of MARBL's literary collections, which contain the world's largest collection of contemporary American poetry. But beyond a celebration of words, the event represented the culmination of something bigger — a reminder of exactly how far the University has come in establishing a growing eminence in the literary arts. From relationships with world-class poets and authors to MARBL's extensive collections, from a nationally-ranked Creative Writing Program to faculty members who include celebrated writers and scholars, Emory's strengths in the literary arts have helped the University emerge as a top destination for writers, literary scholars and students, says Michael Elliott, senior associate dean for faculty in Emory College of Arts and Sciences and Winship Distinguished Research Professor in English. "It's a great moment of everything really coming together," Elliott says. "The work has been going on for a long time, but what we're seeing now is quite unique — we've created something special." "What makes us strong," he adds, "is the sum of our parts." No one has witnessed that growth quite like Ron Schuchard, Goodrich C. White Professor of English Emeritus, whom many view as both a key architect and tireless ambassador behind Emory's literary ascent. "It's been rather meteoric," Schuchard acknowledges. "What has transpired at Emory over the last 35 years I don't think has been matched by any other university in such a short time." Schuchard traces the roots of Emory's trajectory to 1979, when noted literary critic and scholar Richard Ellmann was appointed the first Robert W. Woodruff professor, with lectures that never failed to pack campus venues. Ellmann would also prove instrumental in helping the library acquire a critical collection of writings from the Irish poet W.B. Yeats — the cornerstone of what would become its modern literature collection. In 1987, as Ellmann's health declined, Schuchard proposed creating a lecture series in his honor. Emory President James Laney personally brought the news to Ellmann, who asked that Irish poet Seamus Heaney inaugurate the series. It was a pivotal — and fortuitous — invitation. After Heaney launched the Richard Ellmann Lectures in Modern Literature, "quite by surprise, he gave his manuscripts of the lectures and all correspondence associated with them to the (Woodruff) library," Schuchard says. "And so we started building the great collection we have today." Inspired by the gift, Linda Mathews — then head of Emory's special collections —suggested growing the University's literary collections in a more contemporary vein. In time, MARBL holdings have expanded to include some of the 20th century's top British, Irish and American poets, African American literature — including the papers of Pulitzer Prize-winning author Alice Walker — and Southern writers, including papers from James Dickey and Flannery O'Connor. Capping off the collection is the Raymond Danowski Poetry Library, more than 75,000 rare and first editions of modern and contemporary poetry, praised by the New York Times as "a nearly complete record of all published English-language poetry in the 20th century." The continued growth has brought not only expanded programming opportunities, but transformations of MARBL's physical environment, acknowledges MARBL Director Rosemary Magee. "We are proud to be at a place widely recognized for these noteworthy literary collections, our outstanding African American materials, and our developing LGBT archives," she says. "MARBL provides a convening place for all members of our community." the literary life that extends across the disciplines," Magee notes. "MARBL vibrates at the intellectual and emotional center of these endeavors with outstanding collections in poetry, modern literature, rare books, and more," she adds, by providing, "firsthand engagement with primary evidence and the creative process." Today, the strength of MARBL plays a symbiotic role in drawing both world-class literary figures and scholars seeking to study them, Elliott says — relationships that have also helped expand and enrich the collections. "It's very circular," says Elliott. "The reason that figures like Rushdie and Heaney come here is because of a rich, scholarly community — and the holdings in MARBL are helping draw a new generation of scholars." That was the case for Assistant English Professor Nathan Suhr-Sytsma, who credits MARBL among his main reasons for coming to work at Emory. During his doctoral work at Yale University, Suhr-Sytsma spent several weeks on research in MARBL, "looking primarily at the contemporary Irish poets' collections, but of course there was a vast amount of material that I didn't have a chance even to start exploring." When Suhr-Sytsma applied for a position at Emory a few years later, he felt drawn not only by "a stellar faculty," but programming strengths in his key areas of interest, including Irish studies and postcolonial studies — a Postcolonial and Minority Studies program has been launched by Abdul JanMohamed, Augustus Baldwin Longstreet Chair in English and African American Studies, and Associate Professor of English Deepika Bahri — as well as an interdisciplinary African Studies program. According to Schuchard, those kinds of connections have been a long-held goal: "We've built a reputation as one of the few universities that lets undergraduates have access to great writing," he says. "When freshmen go to see the first versions of a Seamus Heaney poem, the corrections and original drafts, they're amazed." In many ways, Emory's literary success seems a natural outgrowth of a "longstanding commitment to the humanities and humanistic education," which has helped cultivate a supportive interdisciplinary community, Elliott notes. "One of the things that makes Emory stand out in the landscape of higher education is the way we merge the world of contemporary letters and literary scholarship," he says. "We not only have relationships with figures like Salman Rushdie and Seamus Heaney and a Pulitzer Prize-winning poet on our faculty, we also have world-class literary scholars — all part of one community." Most creative writing programs with "the quality of faculty that we have would be working on a Masters of Fine Arts (MFA) program, focused on training professionals," he adds. "Ours are really integrated into the English department, creating a much more fluid sense of community." "In fact, we're emerging as one of the most significant places in the nation where this kind of broad community exists at this level," he adds, pointing to Emory's growing bonds with Atlanta's broader literary scene and the AJC Decatur Book Festival.